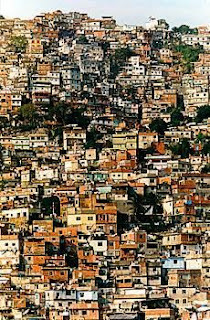 Morrinho means 'little hill' in Portuguese and alludes to the shantytowns, or favela, located on the hills surrounding Rio de Janeiro. 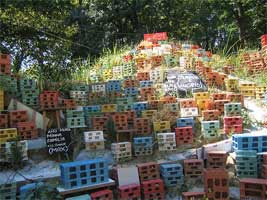 In 1998, kids built up a miniature reproduction of their favela (Pereirão, perched above the upper class Laranjeiras neighbourhood) using bricks and other materials left-over from building their own house. The model covers 300 square meters, and is inhabited by scavenged toys (plastic cars, little figurines carrying AK-47s or a ball, etc.) which are used to re-create scenes of everyday life in a favela: from dance events to clashes between gang members. Morrinho is so true-to-life that it was mistaken for a war plan. “The police told us to take it down,” explains Paulo Vitor. “They thought it was a model being used by the traffickers to plan invasions of other morros (slums). " Fame came to Morrinho in 2001 when filmmaker Fábio Gavião put together a documentary about the mini favela. 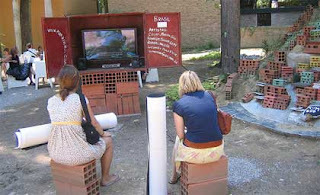 Since then portions of the brick favela have traveled all over the world, the latest stop is at the Giardini of the Venice Biennale. A Morrinho NGO has been created to contribute to the social and economical development of the region and surrounding area. The organisation is carrying out 3 projects: TV Morrinho, independent productions and contracted productions; Morrinho Turism, guided tours of the Morrinho model and exhibition Morrinho, showing a replica model in a smaller scale in other cities. The NGO also plans to offer workshops to provide professional skills for the residence of the "Pereirão" community. These workshops focus on areas such as audiovisual, art education, Brazillian culture, Youth and Citizenship and others. The favela reappears at the Arsenale in the work of photographer Paula Trope who documented the project together with the children of Morrinho. She made pin-hole cameras out of tin cans and handed them to the boys so that they could take pictures.